Renert oder de Fûuss am Frack an a Mansgre’sst. Op en Neis photographe’ert vun engem Letzebreger. 21 Biller vum A[uguste] Trémont a 4 vum Fr[antz] Seymetz. 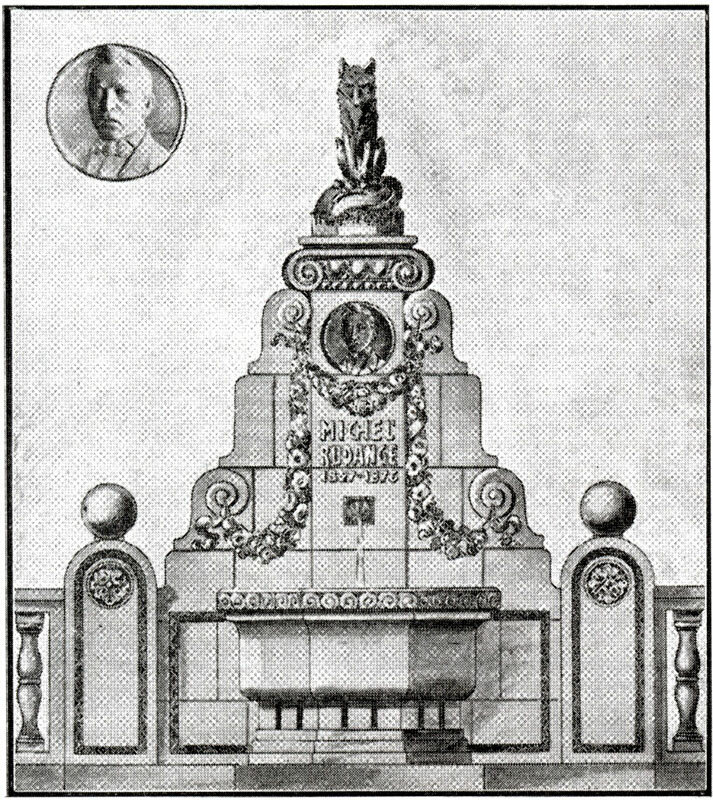 Letzeburg: Linden & Hansen 1921. Volume Nr. 1 in leather. Private collection. 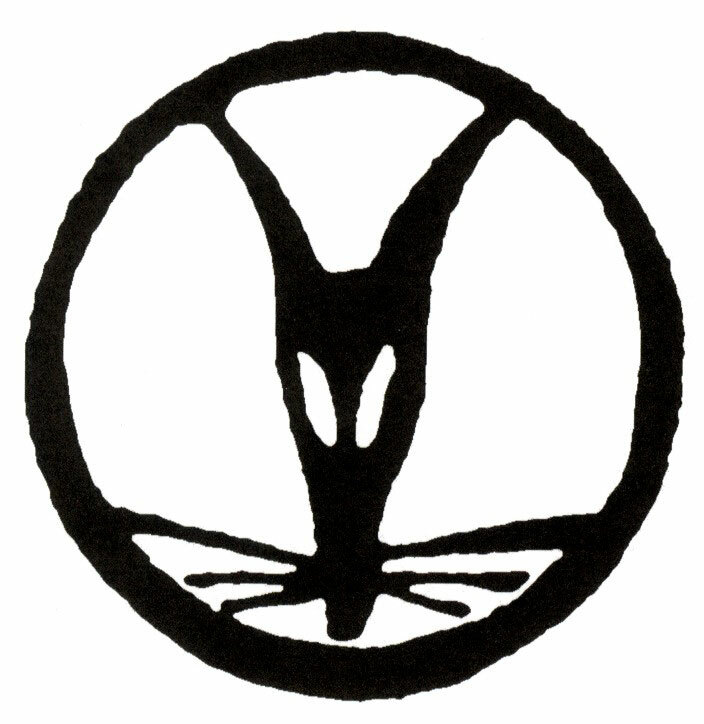 ‘Renert’ is the fabulesque fox figure and main protagonist of Michel Rodange’s verse epos Renert oder de Fuuß am Frack an a Ma’nsgrëßt (Renert or the fox in a tailcoat and in human shape. Again photographed by M. Rodange). 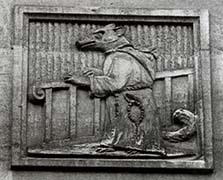 Rodange’s poem draws on the rich European literary heritage from Esop’s fables, to the French Le Roman de Renart, to Johann Wolfgang von Goethe’s Reineke Fuchs. 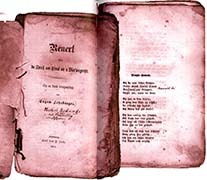 Michel Rodange, who owned the 1858 Cotta Edition of Goethes poem, wrote an original Luxembourgian verse epos in 14 cantos, 1513 strophes and 6052 verses. As the title shows, we are not dealing with an animal story, but with a satirical mirror image of Luxembourg’s social sphere. Conversely, Rodange, who was an avid follower of Luxembourgian social-political news, transposed his criticism and social scepticism to the animal society in which his fox ‘Renert’ lives. ‘Renert’ behaves like a human being, with all its self-centeredness and agressivity. In defiance of the rules of law and morality he intelligently evades all those who want to chastise him, and while he is maliciously feeding on his fellow animals he does not fail to unveil his compatriots’ weaknesses and blatant hypocrisy. 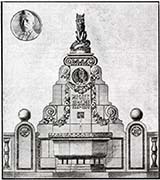 In contrast to the clever fox, Rodange draws a sluggish and unregal lion (a figure that stands for the monarchy) which is unable to keep his royal house in order. 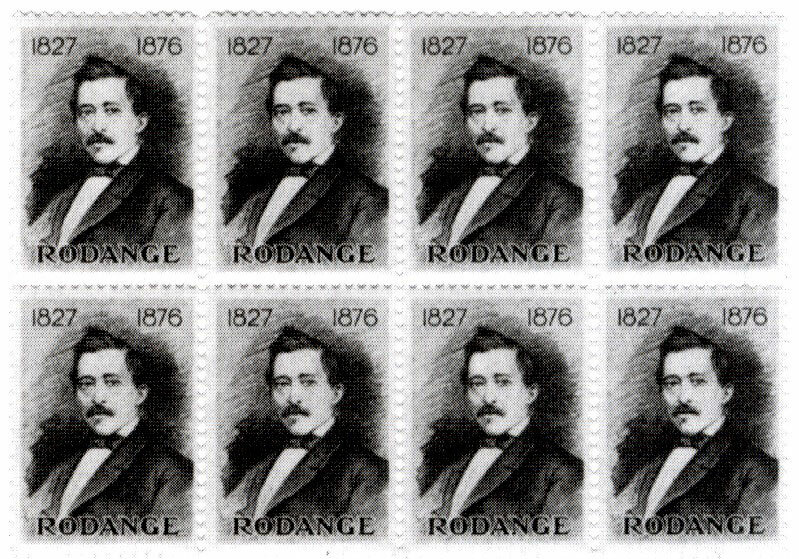 Largely ignored in the 19th century by a scandalized elite, Rodange’s Renert has been appropriated again and again in the 20th century as a token of cultural unification. 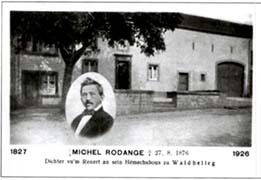 Framed photography of Michel Rodange dating from the year 1864. Signed by the author. Photographer: Dominique Kuhn, Luxembourg. Private collection: Robert Pletschette. 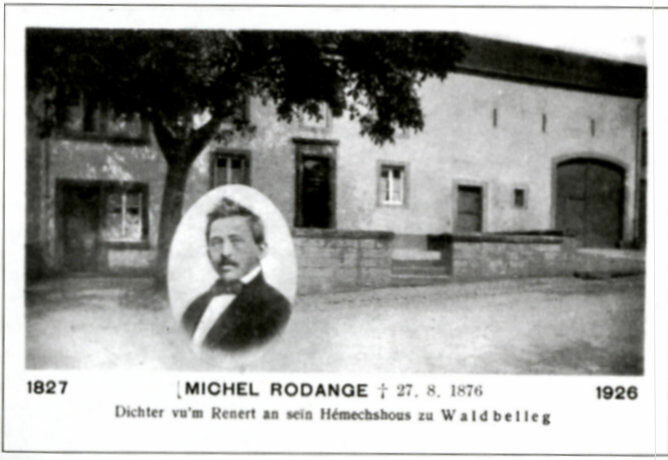 Michel Rodange was born on the 3rd January 1827 as the fifth child of a cobbler in Waldbillig. 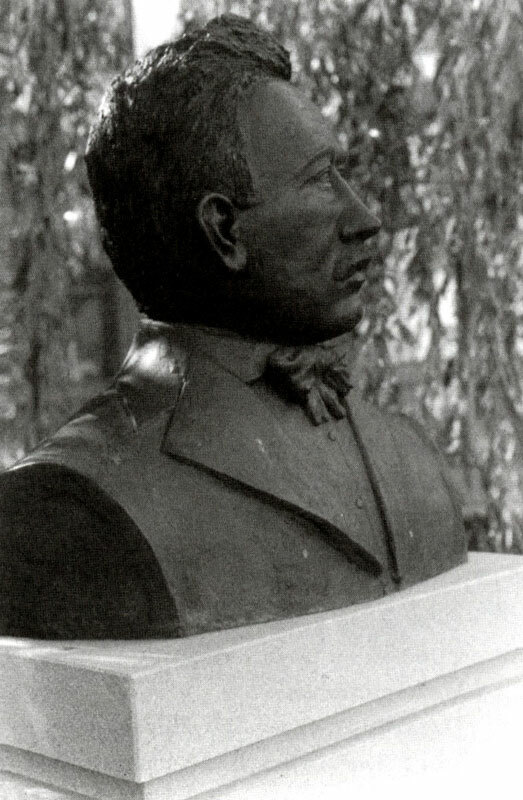 He was trained from 1845 to 1847 in the recently founded teacher’s training school in Luxembourg-city, and in 1847 he started teaching primary school classes. 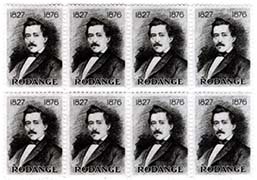 As a result of his poor health – Rodange had developed an ulcer – he decided to leave the demanding and poorly paid teaching profession in 1860, in order to start a career as a lower civil servant in Luxembourg’s regional road-construction administration. Rodange loved to read German poets, such as Goethe, Schiller, Platen, and Uhland, and he was a close observer of social-political developments. 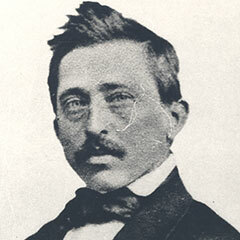 In May 1854 his first Text Die Literatur in Luxemburg appeared in the newspaper Wächter an der Sauer. In the aftermath of the year 1866, when he had to move to the northern town of Wiltz as a result of a professional transfer, he started working on his Luxembourgian epos Renert oder de Fuuß am Frack an a Ma’nsgrëßt. 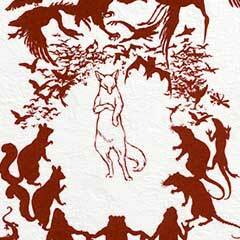 Op en Neis fotografërt vum M. Rodange (Renert or the fox in a tailcoat and in human shape. Again photographed by M. Rodange). Apart from this major work, Michel Rodange produced several other texts, for instance the pastoral poetry collection D’Lëerchen, in which he praises country life and technological progress, as well as Meine Tochter Elisa. 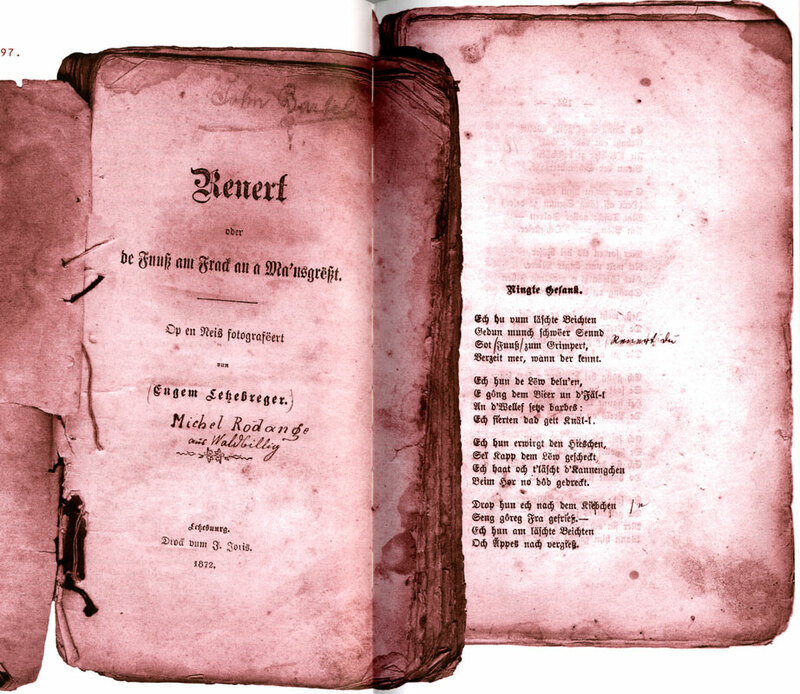 Am zehnten September 1856, a text dedicated to his second child. 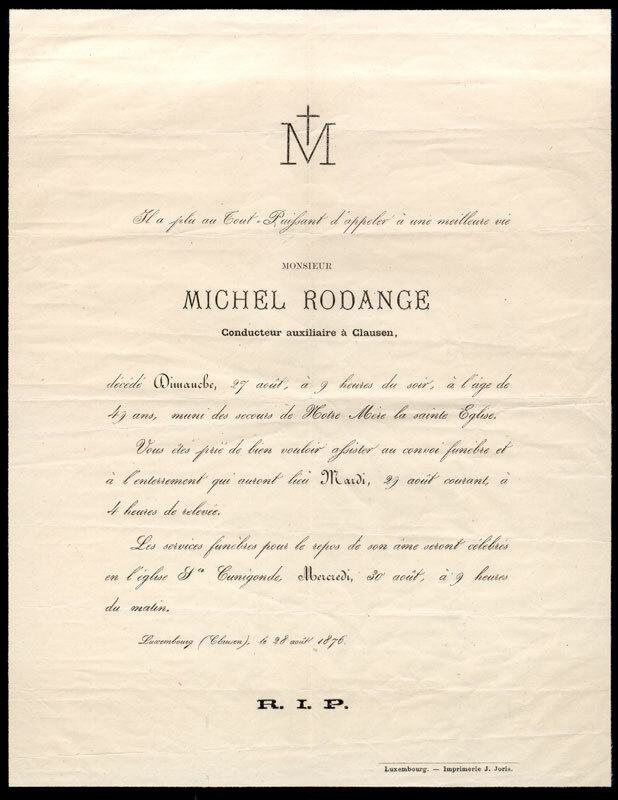 As a consequence of long-standing digestive complications, Michel Rodange died in Luxembourg on the 27th August 1876. Michel Rodange’s Renert draws on a historical context that is marked by political and social crisis and conflict. The political references are drawn from the period between 1867 and the publication of his book in 1872. Only twenty years after the revolution of 1848, Napoleon III was offered the Grand-Duchy of Luxembourg for five million Dutch Florins, and although Luxembourg’s perpetual neutrality was declared at the London conference on 11 May 1867, the crisis culminated in the French-Prussian war of 1870. Rodange draws a caricatural and satirical image of the social, political and cultural developments of the period. 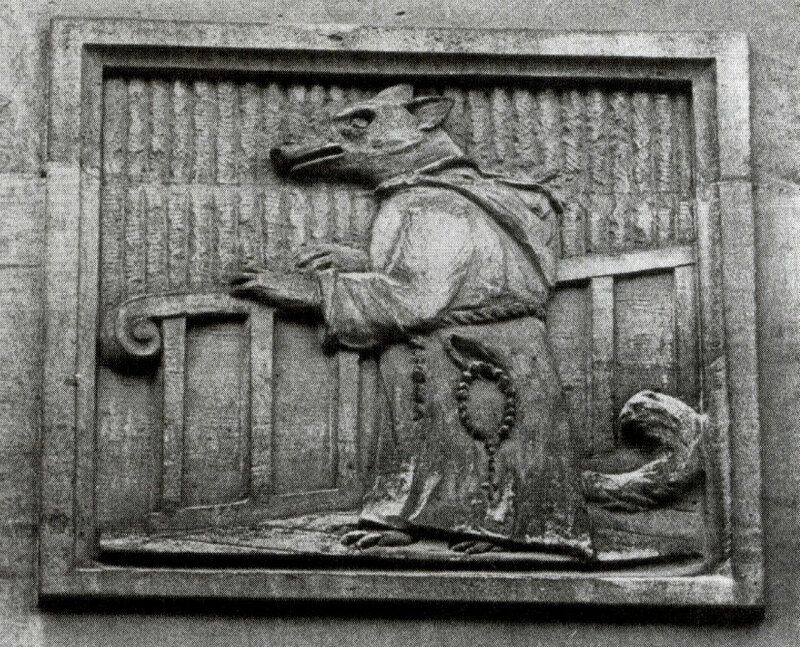 Thus, the Renert contains animal versions of more than 50 identifiable personalities from Luxembourg’s political, economical and clerical spheres. Before the background of the French-Prussian crisis of 1870 and the resulting social-economical crisis, Rodange does not recoil from exposing the dubious machinations of the Luxembourgian Church, industrialists, politicians and other members of the social elites, who, due to a high annual census, wished to divide the spoils of the economy amongst their equals. Those who suffered were the less well off, the lower social strata of workers and day-labourers. Rodange’s text is a courageous literary testimony for the accusations voiced from the lower ranks of society against its higher ranks, as well as against the institutional fabric of the country. Thus, the initial reception of the book was particularly wanting during Rodange’s lifetime, and it is said that only 100 of the 1000 books that were initially printed was sold by 1876.